Ulster has long been known for its textile industries based on the manufacture, and decoration of, cotton and linen. This blog will look at the associated garment making industry in Ulster and the relationship between outworkers and agents. From the mid-1800s until the late 1900s, the stitching industries of Belfast, Ballymena, mid –Ulster and Derry/Londonderry played a major role in the social and economic life of the north of Ireland. The garment industry employed tens of thousands, mostly women, making shirts, collars, aprons, blouses and underwear for the local and global markets. By the 1850s shirt factories in Derry and the surrounding district were producing up to 250,000 shirts per year (1). 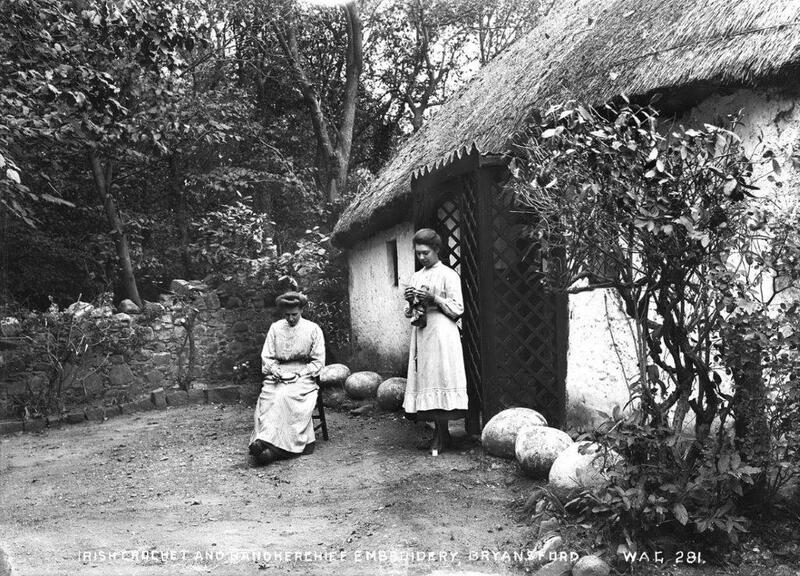 Girls at school in Ireland had, since the 1830s, received instruction in a wide range of needlework techniques, including lace making, crochet, knitting and dressmaking. The National School Board for Education in Ireland published their own textbooks and trained teachers for this curriculum. As traditional skills such as hand spinning of cotton or flax were increasingly replaced by mechanised processes, this education equipped young women for potential employment in the garment and embroidery industries. The School Board also embraced new technology by purchasing hundreds of hand cranked sewing machines for distribution to schools throughout Ireland (2). Outwork supported the stitching industries through a network of highly skilled dressmakers and embroiderers, working to a number of agents, who in turn supplied finished goods to warehouses and retailers. It was common for shirt manufacturers to supply sewing machines for home use by their outworkers. The system of working became commonly known as ‘cut, make and trim’, with the agents providing bundles of pre- cut sections to be embroidered or made up into garments. In 1911 an embroiderer working in her own home could earn 4shillings and sixpence for embroidering monograms on four dozen handkerchiefs. This wage was comparable with that of a farm labourer at the time and the working conditions at home, although sometimes basic, were preferable to conditions in the damp and noisy linen mills (3). In the factories, men were generally responsible for the cutting out of garment sections, to be sewn up in batches of 12 by female stitchers. Use of an electrically-driven band cutter meant that one operative could cut through multiple layers of fabric, up to seventy, at one time. 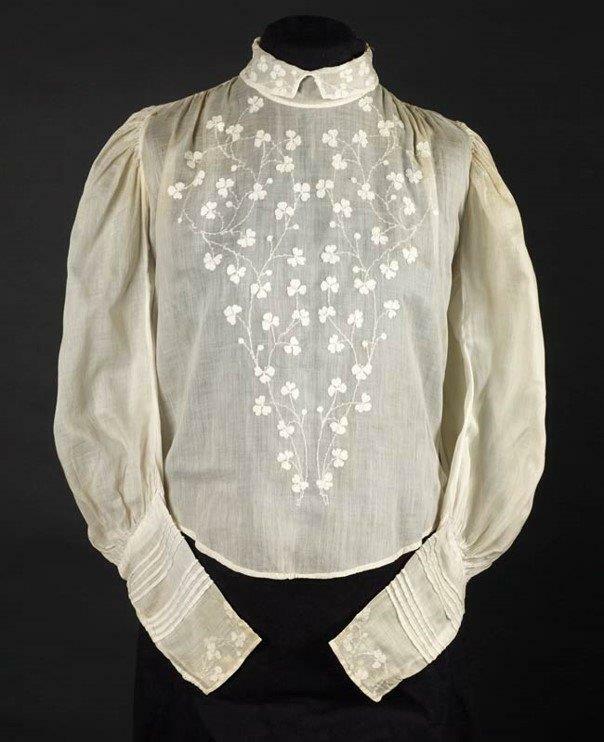 Before production moved entirely into cities or towns the relationship between agents and outworkers prospered, particularly with regard to the finer work on blouses, christening robes, and handkerchiefs. Agents for lace making and embroidery could be found in almost every town and village in Ulster and by the early 1900s The Belfast School of Art was producing a steady stream of designers trained for work in the textiles industry (4). Some factories adopted a dual approach for a while, employing both outworkers and site-based workers until the growth of the ready- to- wear market made it more economic to centralise production. 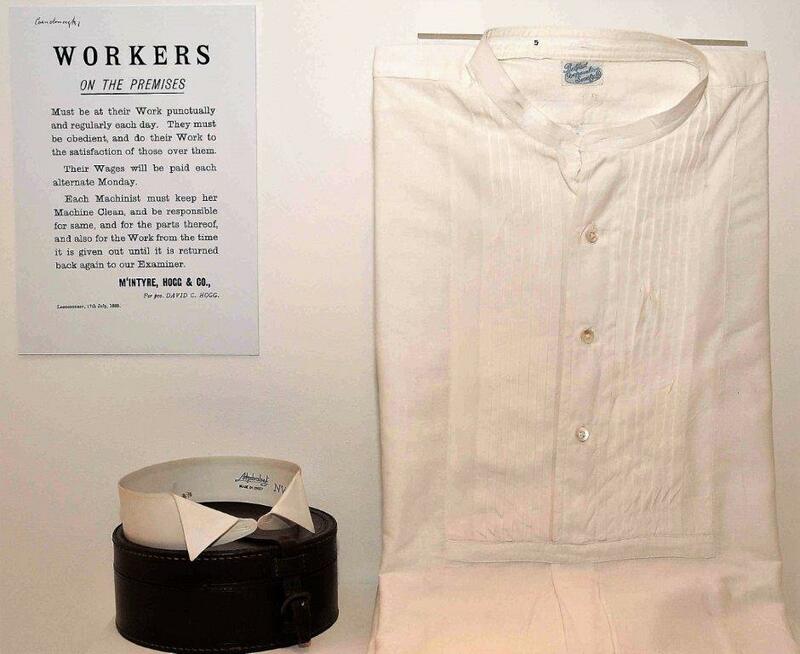 From the late 1800s, up until the 1920s, white shirts made in Derry dominated the European market. In 1912 Derry-based factories exported twenty million collars annually (5). The Tillie factory had the largest concentration of installed sewing machines in the world, meriting a mention in Das Kapital by Karl Marx. Shirt making in Derry and the North West provide plentiful employment for women and the products were often marketed as “Derry made by Derry maids”. Garment manufacture in Ulster received a much-needed boost during WW2 by producing shirts, uniforms, aprons and overalls under the British government’s Utility Clothing Scheme. The industry slumped after the 1950s however as technology evolved and factories adopted American–led working practices. Glenaden, one of the last of the large 44 shirt factories that once defined the city of Derry, closed in 2008. Today, Smyth & Gibson are the only remaining shirt factory in the city, hand- cutting in traditional style, producing shirts for the high-end market in menswear. Initiatives such Linen Biennale NI 2018 however offer a glimmer of hope for the future, encouraging a rethink of textile design – with fashions based on ethical, sustainable and innovative uses of familiar fabrics, allied to traditional cutting and piecing skills. 1. Galvin, Robert. Fabrics and Fabrication, History of the clothing industry in Derry. (The Context Gallery, Derry, 2001). 2. Rafferty, Deirdre, and Susan M. Parkes. Female Education in Ireland 1700 – 1900. (Irish Academic Press, Dublin, 2007). 3. Wilson, Kathleen Curtis. Irish People, Irish Linen. (Ohio University Press. Athens, Ohio, 2011). 4. Bruce, Hazel. H.R.Lilley, Artist and Designer. (NI Community Relations Council. Belfast, 1999). 5. Crawford, W.H. The Irish Linen Industry. (Exhibition catalogue, Ulster Folk and Transport Museum, 1987).